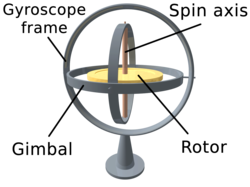 A gyroscope (from Ancient Greek γῦρος gûros, "circle" and σκοπέω skopéō, "to look") is a device used for measuring or maintaining orientation and angular velocity. It is a spinning wheel or disc in which the axis of rotation (spin axis) is free to assume any orientation by itself. When rotating, the orientation of this axis is unaffected by tilting or rotation of the mounting, according to the conservation of angular momentum. Applications of gyroscopes include inertial navigation systems, such as in the Hubble Telescope, or inside the steel hull of a submerged submarine. Due to their precision, gyroscopes are also used in gyrotheodolites to maintain direction in tunnel mining. Gyroscopes can be used to construct gyrocompasses, which complement or replace magnetic compasses (in ships, aircraft and spacecraft, vehicles in general), to assist in stability (bicycles, motorcycles, and ships) or be used as part of an inertial guidance system. Essentially, a gyroscope is a top combined with a pair of gimbals. Tops were invented in many different civilizations, including classical Greece, Rome, and China. Most of these were not utilized as instruments. 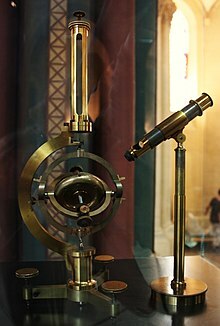 The first instrument used more like an actual gyroscope was made by Johann Bohnenberger of Germany, who first wrote about it in 1817. At first he called it the "Machine". Bohnenberger's machine was based on a rotating massive sphere. In 1832, American Walter R. Johnson developed a similar device that was based on a rotating disc. The French mathematician Pierre-Simon Laplace, working at the École Polytechnique in Paris, recommended the machine for use as a teaching aid, and thus it came to the attention of Léon Foucault. In 1852, Foucault used it in an experiment involving the rotation of the Earth. It was Foucault who gave the device its modern name, in an experiment to see (Greek skopeein, to see) the Earth's rotation (Greek gyros, circle or rotation),  which was visible in the 8 to 10 minutes before friction slowed the spinning rotor. A gyrostat consists of a massive flywheel concealed in a solid casing. Its behaviour on a table, or with various modes of suspension or support, serves to illustrate the curious reversal of the ordinary laws of static equilibrium due to the gyrostatic behaviour of the interior invisible flywheel when rotated rapidly. The first gyrostat was designed by Lord Kelvin to illustrate the more complicated state of motion of a spinning body when free to wander about on a horizontal plane, like a top spun on the pavement, or a bicycle on the road. Kelvin also made use of gyrostats to develop mechanical theories of the elasticity of matter and of the ether. . In modern continuum mechanics there is a variety of these models, based on ideas of Lord Kelvin. They represent a specific type of Cosserat theories (suggested for the first time by Eugène Cosserat and François Cosserat), which can be used for description of artificially made smart materials as well as of other complex media. One of them, so-called Kelvin's medium, has the same equations as magnetic insulators near the state of magnetic saturation in the approximation of quasimagnetostatics . A dynamically tuned gyroscope (DTG) is a rotor suspended by a universal joint with flexure pivots. The flexure spring stiffness is independent of spin rate. 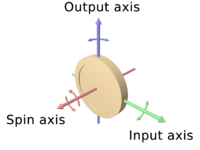 However, the dynamic inertia (from the gyroscopic reaction effect) from the gimbal provides negative spring stiffness proportional to the square of the spin speed (Howe and Savet, 1964; Lawrence, 1998). Therefore, at a particular speed, called the tuning speed, the two moments cancel each other, freeing the rotor from torque, a necessary condition for an ideal gyroscope. Nintendo has integrated a gyroscope into the Wii console's Wii Remote controller by an additional piece of hardware called " Wii MotionPlus". It is also included in the 3DS and the Wii U GamePad, which detects movement when turning. ^ " Gyroscope Archived 30 April 2008 at the Wayback Machine" by Sándor Kabai, Wolfram Demonstrations Project.